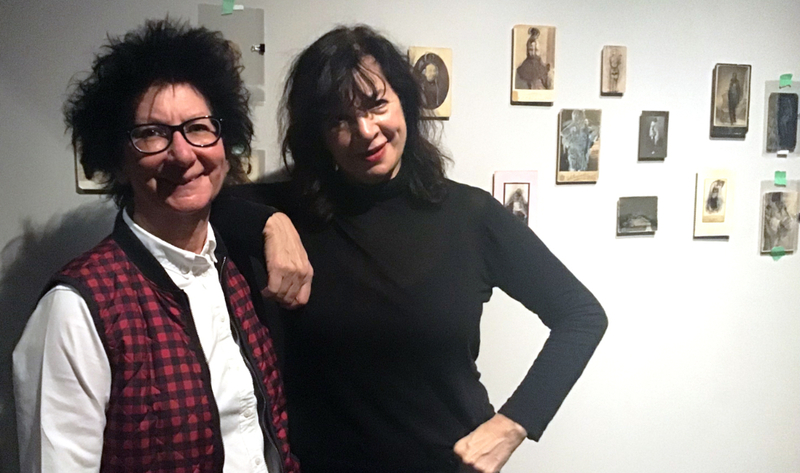 Curator Lynn Ruscheinsky (left) and artist Angela Grossmann. For more than 20 years, senior Canadian artist Angela Grossmann has sought to re-create and re-dress the marginalized, the misunderstood and the dispossessed through her art. Her new exhibition, titled Troublemakers, opens at the McMaster Museum of Art on Thursday January 17 at 6 pm, followed by a public conversation between Grossmann and curator Lynn Ruscheinsky in the exhibition space the next day at 12:30 pm. The exhibition features 68 dynamic mixed media works, some recent and some drawn from past exhibitions. The artist draws upon her large found photograph archive including vintage and risqué images which she deconstructs and strategically re-makes. 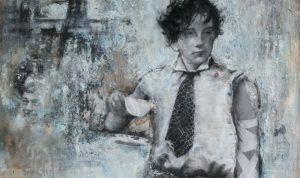 Grossmann’s paintings and collages have been the subject of more than 20 solo shows internationally and The Art Newspaper listed her as one of 100 artists who have most influenced students at art schools in Britain in 2006. “The most prominent, most creative and unspoken attraction in Grossmann’s work is her exceptional ability to create believable characters triumphant in their troublemaking,” says Ruscheinsky. 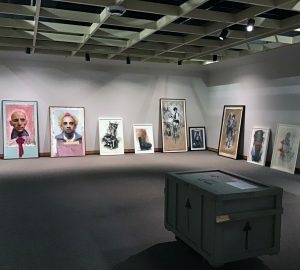 Troublemakers is one of three solo exhibitions by Canadian artists opening at the museum on Thursday. Also opening that evening is Hamilton artist Michael Allgoewer’s installation “1514,” inspired by an Albrecht Durer engraving, and Jaime Angelopoulos’s “Oblique Choreography,” curated by Ivan Jurakic. Admission the Museum and its events are free. The exhibition continues until March 9. For more information, go to https://museum.mcmaster.ca/about/news/grossmann/. For more than 20 years, senior Canadian artist Angela Grossmann has sought to re-create and re-dress the marginalized, the misunderstood and the dispossessed through her art. Her new exhibition, titled <em>Troublemakers,</em> opens at the McMaster Museum of Art on Thursday January 17 at 6 pm, followed by a public conversation between Grossmann and curator Lynn Ruscheinsky in the exhibition space the next day at 12:30 pm. The exhibition features 68 dynamic mixed media works, some recent and some drawn from past exhibitions. The artist draws upon her large found photograph archive including vintage and risqué images which she deconstructs and strategically re-makes. [caption id="attachment_85863" align="alignnone" width="458"]<img class="wp-image-85863 " src="http://dailynews.mcmaster.ca/wp-content/uploads/sites/3/2019/01/Grossmann_Teatime-detail-300x178.jpg" alt="" width="458" height="272" /> Angela Grossmann, Teatime (detail)[/caption] Grossmann’s paintings and collages have been the subject of more than 20 solo shows internationally and <em>The Art Newspaper</em> listed her as one of 100 artists who have most influenced students at art schools in Britain in 2006. “The most prominent, most creative and unspoken attraction in Grossmann’s work is her exceptional ability to create believable characters triumphant in their troublemaking,” says Ruscheinsky. [caption id="attachment_85866" align="alignnone" width="459"]<img class="wp-image-85866" src="http://dailynews.mcmaster.ca/wp-content/uploads/sites/3/2019/01/Unpacking-Troublemakers-Grossmann2-300x270.jpg" alt="" width="459" height="413" /> Unpacking Angela Grossmann's exhibition, Troublemakers[/caption] <em>Troublemakers</em> is one of three solo exhibitions by Canadian artists opening at the museum on Thursday. Also opening that evening is Hamilton artist Michael Allgoewer’s installation “1514,” inspired by an Albrecht Durer engraving, and Jaime Angelopoulos’s “Oblique Choreography,” curated by Ivan Jurakic. Admission the Museum and its events are free. The exhibition continues until March 9. For more information, go to <a href="https://museum.mcmaster.ca/about/news/grossmann/">https://museum.mcmaster.ca/about/news/grossmann/</a>.